Summertime is all about the chilling, swimming, and grilling. But oh the grilling when you are vegetarian or vegan. What do you do then? To be honest, there isn’t an Indian version of a hot dog that’s quick to make, so other than that cheese cutlet, there aren’t many options. Enter the vegan dog! Lightlife makes all plant based products from veggie burgers to veggie bacon to veggie dogs! These are perfect for desi kids who want to participate in all things American summer offers without the meat. 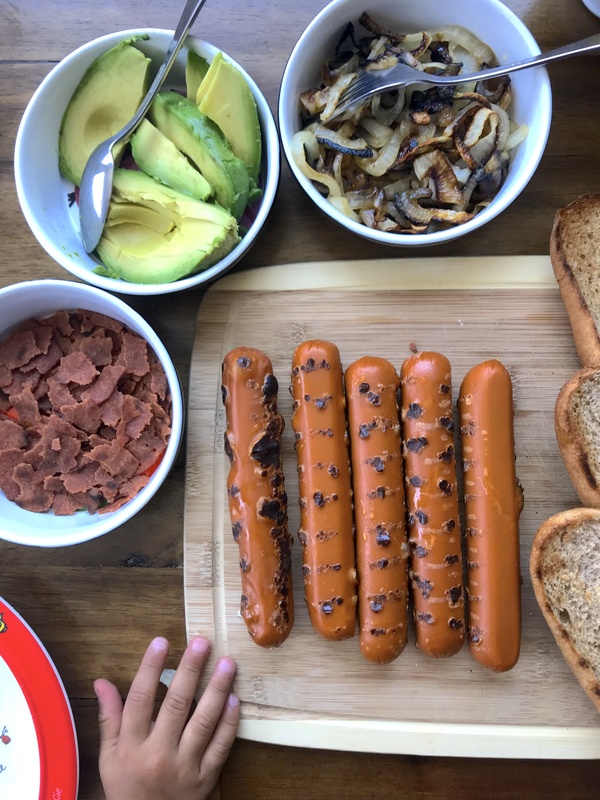 Lightlife was kind to send us some hot dogs and bacon and since my toddler son is well, in a hot dog obsessed stage. This was the perfect opportunity to create hot dog day. Since I’m Indian, I love grilled/sauteed onions. YUMMY. Fire up the stove and saute one onion for 10 minutes in olive oil. You want the onions to melt and become caramelized. Once the onions are done you can turn off the stove and let them cool in the pan. 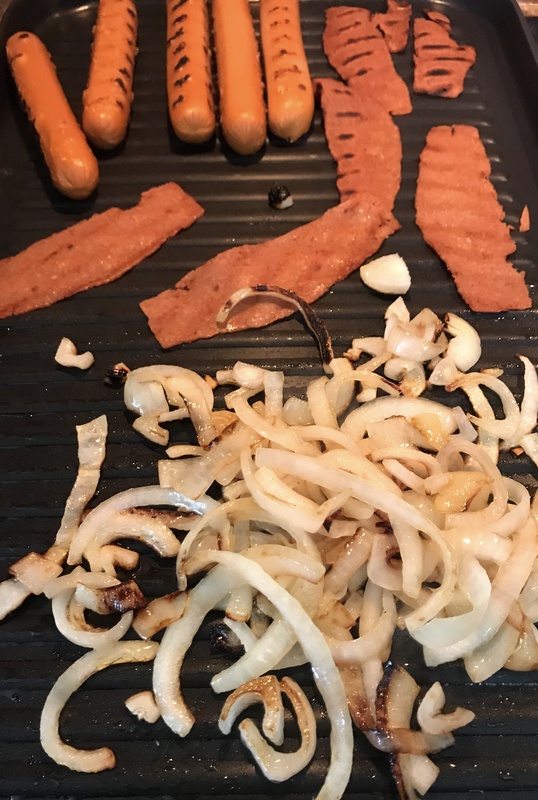 On an indoor grill pan or outside grill, put the veggie dogs and bacon on. Cook on medium-high for 5-7 minutes – we like them with a little char. Once done, well, you’re done! You could get fancy and make a chutney to go with the dogs, but we stuck with classic Americana of Heinz’s mustard, ketchup, and sweet relish. We also had the grilled onions, avocado because we are Californian, vegan mayo, and crumbled Smart Bacon. Those little hands couldn’t wait to eat it! For the kids and adults, we loved the soy based Lightlife dogs. It’s a great alternative to meat hog dogs and bacon, while maintaining taste. 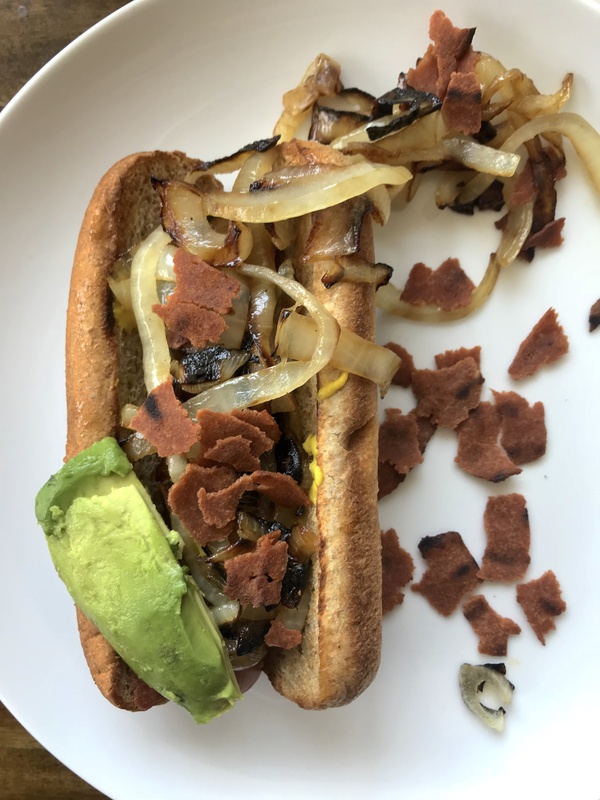 A tiny word of caution, if you a vegetarian who has never tasted meat, the Lightlife hot dogs and bacon do have a meaty flavor – it could be a taste bud surprise. You can buy LightLife products at Safeway, 365 Whole Foods, Whole Foods, Sprouts, and many other stores. Disclosure: This post is sponsored by Lightlife. All thoughts and opinions are my own.